HOUSTON — Two astronauts working speedily outside the International Space Station removed a faulty pump module ahead of schedule, potentially negating the need for a planned Christmas Day spacewalk as they work to repair the outpost’s critical cooling system. NASA astronauts Rick Mastracchio and Mike Hopkins ventured outside the space station at 7:01 a.m. EST (1101 GMT) today (Dec. 21), just 10 days after a flow control valve malfunctioned inside the pump module that they were set to remove and replace during another 6.5-hour spacewalk on Monday. Saturday’s spacewalk ended at 12:29 p.m. EST (1729 GMT), five hours and 28 minutes after it began. “We’re about an hour and a half ahead of the timeline, so, choosing your own adventure, we’re going to go ahead and look forward to doing the pump module exit,” Mission Control advised the astronauts. The early removal could mean that a third spacewalk planned for Dec. 25, Christmas Day, may not be needed. The faulty valve, which regulates the temperature of ammonia flowing through the pump, ceased working properly on Dec. 11. Non-critical systems and science experiments in two of the station’s laboratories have been powered down since. Saturday’s spacewalk was originally focused on only disconnecting the fluid lines from the failed pump module and installing a “jumper” box to keep the ammonia from over pressurizing during the pump’s replacement. Working along the starboard, or right, side of the station’s backbone truss, Mastracchio (riding on the end of the Canadarm2 robotic arm) and Hopkins first set about demating “quick disconnect” fluid lines from the faulty pump. As their name implies, the quick disconnects were designed to be plugged in and out, but past spacewalks, including an August 2010 outing to replace the same pump module, ran into problems getting the pressurized lines loose. Learning from previous experiences, the pressure in the lines was reduced in preparation for Saturday’s spacewalk. As such, Mastracchio and Hopkins were able to disconnect the first two fluid lines with little trouble. 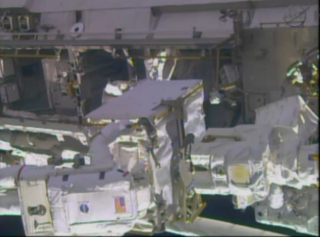 The first of the lines was unplugged an hour and 45 minutes into the spacewalk. As the lines were loosened though, the spacewalkers did report seeing “snow” — flakes of frozen ammonia — floating from the connectors. "I do see some snow, very little," Masstrachio said. "Very small flakes coming from the forward side of the [quick disconnect]. Very small flakes." With the first two lines released from the pump module, Mastracchio and Hopkins next worked to connect them to a "jumper" box, which routes the ammonia back into the coolant loop to keep it in a liquid phase. That task was followed by the astronauts disconnecting the remaining fluid lines and five electrical lines from the pump module to be replaced. It was the ease in which the lines were removed that allowed the time for the pump module to be removed. Mastracchio had only one note of concern for the additional work: his cold toes. To remove the 780-pound (355 kilogram) pump module, four bolts holding the module in place needed to be released. Mastracchio, still riding on the arm, then pulled the bulky pump out of the space station’s truss part of the way so Hopkins could install a robotic arm grapple fixture on its side. Working from inside the station, Japan Aerospace Exploration Agency (JAXA) astronaut Koichi Wakata then controlled the arm to “fly” Mastracchio, holding the pump module, to the pump’s temporary storage location, called the POA (Payload/Orbital Replacement Unit Accommodations). At the start of the spacewalk, Hopkins had also been scheduled to ready the replacement pump module to be installed on Monday, but after consulting with Mastracchio, Mission Control agreed to end the outing after the faulty pump module was stowed. Saturday’s extra-vehicular activity (EVA or spacewalk) was the first to use U.S. spacesuits since July, when water unexpectedly flooded into Italian astronaut Luca Parmitano’s helmet. Hopkins wore Parmitano’s suit for this spacewalk but with a new filter assembly, replacing the faulty component. As a precaution, NASA engineers had both astronauts outfit their suits with absorption pads and makeshift snorkels, but they were not needed. Mastracchio’s and Hopkins’ helmets remained water-free throughout the spacewalk, as confirmed during periodic checks. This was Mastracchio’s seventh career spacewalk and Hopkins’ first. Overall, it was the 175th spacewalk in support of the assembly and maintenance of the International Space Station. Monday’s spacewalk will pick up where Saturday’s excursion ended, with Mastracchio and Hopkins working to install the spare pump module where the faulty unit had been removed. Depending on how far they get with the new pump module’s connections on Monday, a Christmas day outing planned to reconnect the quick disconnect fluid lines and stow the old pump module for possible future servicing may not be necessary.